Click “Result” below for a demo. cached image buggyness becomes apparent as CSS transitions on the 302 redirect are jittered. On Firefox, in both cache situations, 302 redirects are still bugged. This implies Firefox uses the cached image from the 2nd HTTP request. In Safari, transitions work perfectly regardless of cache or HTTP status. I am taking a video game development class, and we are using a devkit called AppGameKit. AppGameKit is very easy to understand, simple, and works on a wide variety of environments, including Android and IOS. My game idea is very ambitious. It is called SalsaMe, and is a salsa dancing game with an interface inspired by Guitar Hero. It’s kicker is that it would have a wide variety of moves and combinations that are activated through the use of gestures. Loving a challenge, I somehow got inspired by the crazy idea of using Microsoft Kinect to do motioncapture (with Brekel Kinect) and animate the moves using AutoDesk MotionBuilder. Unfortunately AppGameKit’s newly introduced 3D features do not support skeletal character animation, or the import/conversion of FBX files (a seemingly industry standard). And unfortunately for me I discovered this late in the project. I was having too much fun animating. AppGameKit seems more fit for retro-style games. So just for the purpose of completing the project, I needed to convert these animations into sprites. AppGameKit comes with a tool called AGK Image Joiner. It’s suppose to take a bunch of image files and combine them into a single file (an “atlas”), and produce a txt file with coordinate data. This tool is very buggy and low-level. It gave me confusing error messages, and was quite a hassle to try to figure out. Before this I tried other methods using Photoshop, and the ImageMagick library’s montage function. However AGK expects images to be layed out left to right, and it was not an easy solution with the different animations I was outputting from MotionBuilder. This is where TexturePacker comes in. I came across TexturePacker on the AGK forums. Upon installing this program, I instantly knew it was a high-quality tool with its install interface and easy interface. I didn’t even need instructions to use it, the GUI provides very helpful tooltip hoverovers. Set the layout algorithm to sort by filename, so all animation frames were in order. Adjusted the Scale, so all animation frames fit into the file. In this case it is about .81, which isn’t too bad of a quality loss for my workaround. This was also a huge plus as I didn’t need to run a Photoshop script to resize my animation frame images. This was almost too easy. I was so impressed with the tool I also learned that it can be used as a Sprite creator for any environment. As a web developer, I found this to be awesome. Often times we have hover-overs, or simple graphic changes on websites. Using TexturePacker I can create one sprite png easily (no fuddling around in photoshop), and use background-position to do the animations. I highly recommend this tool to anyone working with 2d graphics / animation, it’s applications are far reaching! Oftentimes when we are surfing the net, we come across photos or images that are not attributed to any source. Google solves this problem for us with Google Image Search ”Search by Image” feature. Recently I have started a Tumblr application that finds photos of particular models on the Tumblr network. One problem I had was that oftentimes you couldn’t find what the source of the image was, where it came from, or what the model’s name was as there was no tags, watermarks, or any information besides the photo. I wanted to give my users a way to find out the source of the photo with a “Find similar images” button. You may use http://images.google.com/searchbyimage with a image_url GET variable to find similar images to a given URL. This makes it easy to programmatically create a “Find similiar images” button. Tumblr’s API v2 now requires that if you’d like to execute user commands such as posting, getting user info, or reblogging on behalf of a Tumblr account, you will need to authenticate via OAuth. This is basically a method to authenticate an application without disclosing a user’s password credentials to the application. Application requests a request token from Tumblr, while specifying a callback URL to Tumblr that the user will be redirected to after “allowing” your application. Tumblr responds, as long as your app is registered, with a request token and a request token secret. Both are codes. Application saves the request token secret for later use, and redirects the user to Tumblr’s authorize service so the user can click ‘Allow’ or ‘Deny’ with regards to your application requesting permissions. 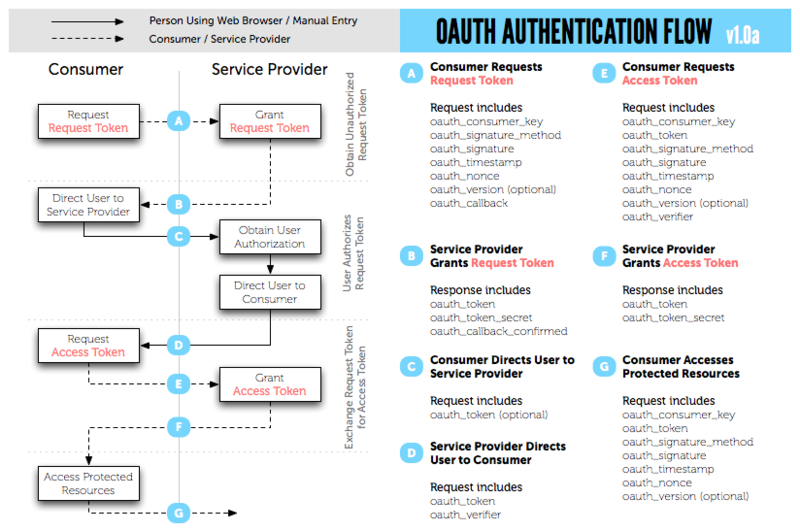 Finally, application uses oauth_token and the request token secret to request the access token and access token secret. Application can now make requests to the Tumblr api, and can save the access token and access token secret to a database for future use. To install the OAuth extension on my VPS, I first needed to install the PCRE (Perl Compatible Regular Expressions) library so the OAuth extension can install correctly. Then I can execute the pecl install command. Once installed, we can now proceed with actual coding. The extension provides us with a nice example using Oauth with yahoo’s FireEagle. We are going to modify this example to work with Tumblr. I often see many people having problems getting jPlayer to play audio. Whether they want it to play using HTML5 only, or how to get it to work using Flash, there is often confusion on why it’s not working. I’m here to straighten that up. First things first – what browsers support HTML5 audio – and what kind of audio? For this example, we’re going to create an invisible jPlayer player that first tries the HTML5 audio solution, and if that doesn’t work it will fall back to Flash. We’re going to play a song called “Beer Beer Beer” by Youth of Britain. Now that we got our files sorted out, we’re going to start writing some HTML. Here we fetch the jQuery library from google, and we also are including the jquery.jplayer.min.js. We also have created a div and gave it an id of “player”, this will hold our jPlayer instance. To get HTML5 audio support working with all HTML5 browsers, it is often needed to provide more than 1 type of audio format. For example, OGA and MP3. For older browsers that don’t support HTML5 audio, we can use jPlayer’s flash backup. By default, jPlayer tries the HTML5 audio method first, and then falls back to Flash. This can be changed via the solution option. ready: When jPlayer is loaded, set its media to “Beer Beer Beer” by Youth of Britain, utilizing two formats: beer.ogg and beer.mp3. Then play it. supplied: The media has been supplied with two formats: oga and mp3. This will allow jPlayer to try each in the HTML5 audio solution. For example, OGA would work in Firefox but not Safari, but MP3 would work in Safari but not Firefox. solution: Try HTML5 audio solution first, if that doesn’t work then try the Flash solution. This can be re-engineered to HTML5 only with “html” or Flash only with “flash”.